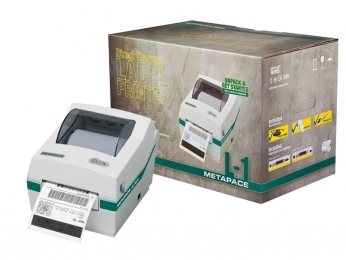 The L-1 is a direct thermal label printer suitable for many applications in warehouses, laboratories, and logistics. Faithful to the professional concept of Metapace hardware, the L-1 also comes in a complete package that is ready for immediate use. A PSU, triple interface and dispenser give you enormous flexibility at a favourable price. With its broad printing width of up to 112 mm and high speed of up to 127 mm/sec., it is ideal for bar code labels as well as shipping labels, product signs and the like. Maximum label width 112 mm, maximum speed 127 mm/sec. Using the L-1, you print direct thermal labels quickly and cost-effectively. The printed labels can be used for short-term and medium-term applications that do not involve excessive heat. Its 8 dots/mm 203 dpi resolution produces perfect and pin-sharp printouts - anything from bar codes to text or drawings to logos. Furthermore, this new version incorporates additional character sets for an extra wide choice of fonts giving you more flexibility in various applications. Even wider labels are no problem, as the L-1 accepts rolls with a width up to 112 mm - and naturally also narrower ones. The roller guide is continuously adjustable for narrower label widths. Roll changes do not require threading anymore simply open the lid, insert a new roll, and close the lid again. Further features of the new version include an improved gap sensor for professional label positioning, a 16MBit flash memory in which you store logos and images, and expanded statistical data recording. Integration of various systems is particularly easy with the L-1, as the printer can be used via the integrated parallel and USB interface simultaneously. In other words, the printer is compatible with any existing system you may use, and can be used by more than one work stations at a time. Accordingly, the printer recognises automatically which interface is in use. The standard version of the L-1 is already equipped with a peeler - a feature that is usually only available optionally at extra cost. This makes inconvenient removal of labels from the carrier material obsolete, which is especially handy with print-on-demand solutions. If you use continuous feed labels instead of normal label rolls, the paper is fed into the printer from the rear. Through its compatibility to both standard control languages for label printers, ZPL as well as EPL, the printer easily integrates itself into all common systems. The compatibility to the Windows 95/98/ME/2000/NT/XP/2003/VISTA and OPOS operating systems guarantee you easy integration. Immediately ready for use, a label roll is included in the delivery and the cleaning pen supports you in caring for their printer and ensures successful operation for years to come.